Talks between the Thai government and rebel groups are set to resume in Kuala Lumpur on Friday after a series of bombings and arson attacks in tourist hotspots that have focused attention on an ongoing insurgency in the country’s south, officials from both sides confirmed this week. Though the southern Thailand insurgency has waxed and waned for decades, a new wave of violence in the Malay-Muslim-majority southernmost provinces since 2004 has left over 6,000 people dead in one of Asia’s deadliest ongoing conflicts. Multiple rounds of talks have been held to no avail, with the most recent one stalling in April following disagreements over terms of reference (TOR) that would govern future negotiations. Now talks between the Thai government and MARA Patani – an organization representing the rebel groups – are set to resume on Friday, with the Malaysian government continuing its role as facilitator. Malaysia’s national news agency Bernama cited internal sources as saying on August 22 that the talks would mark the “start of a formal dialogue” and that issues raised in the TOR had been resolved. The talks would also focus on substantive issues on the ongoing insurgency, though few additional details were provided. Thai Prime Minister Prayut Chan-o-cha also said last Tuesday that peace talks with insurgent groups would resume on September 2. But in the days leading up to the talks, it was still not clear whether they would actually occur or would lead to productive discussions. Thai officials repeatedly said talks would not be held without peace and that they would not be pressured into talking, amid speculation that the bombings and arson attacks that grabbed headlines were carried out by southern Thailand insurgents to force the government back to the negotiating table. Even though talks are set to resume later this week, there is no shortage of reasons to be skeptical about whether they will yield a productive outcome, as I’ve written elsewhere (See: “To End Southern Insurgency, Thailand Must Confront Hard Realities”). For one thing, even sustaining talks has proven to be challenging in the past, with disagreements among the parties resulting in months of stalling and acts by spoilers on both sides repeatedly undermining talks even when incremental progress seems to be made. And even if talks do stutter on, there is little indication thus far that the Thai government is serious about pairing negotiations with other initiatives that begin to address the real root cases of the conflict, which include a legacy of colonization by the Thai state and a culture of impunity among Thai security forces. Satisfying key insurgent demands, like devolution or meaningful autonomy, has not been easy for the Thai government to do, especially when some key officials still refuse to admit the true nature of the insurgency and dismiss it as a law enforcement or economic development issue. Beyond the talks themselves, the insurgency and related issues are also expected to be discussed during Malaysian Prime Minister Najib Razak’s upcoming two-day visit to Thailand September 8-9. 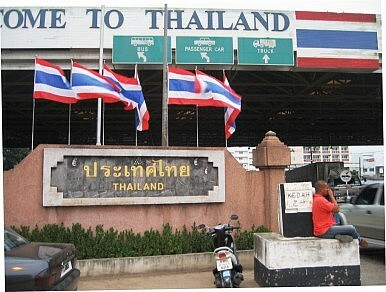 Border issues will be at the center of talks during Malaysian premier Najib Razak's visit to Thailand.